I don’t drink coffee. I don’t like coffee. Coffee smells great but tastes terrible. Coffee is super bitter, how could anyone like it? Yuck, coffee, no thank you. All things I’ve said about coffee for years and years. I then experimented with a Homemade Chocolate Caramel Creamer because so many of you asked for a healthier creamer option. To my surprise, I kind of liked it. But only kind of. Months went by. I maintained my “I’m not a coffee drinker” status. During the winter I was introduced to Crio Bru, which is brewed ground cocoa beans, and it is delicious. I began enjoying a cup during my God time each morning. Perfectly delightful. I believe the kicker was my Oklahoma City Meet and Greet. We met at Vintage Coffee, a lovely shop owned by my cousin and her husband. My cousin, Carie, talked me through options she thought I might like, which resulted in her making me a cold coffee with chocolate and toffee or some such wonderful combination. It was so delicious, I guzzled it down, wished for more, and have been craving another one ever since. I blame my new interest in coffee on Carie. And on those who came to Meet and Greets. You all obviously forced the stuff down my throat, creating a coffee interest in me that I can no longer deny. I have yet to recreate the delicious brew Carie made for me, and that’s probably a good thing. I would be making them way too often. So here’s my new coffee status: Don’t like it hot. Can’t drink it black. Tastes great cold with an equal part of milk and a little bit of homemade chocolate sauce. 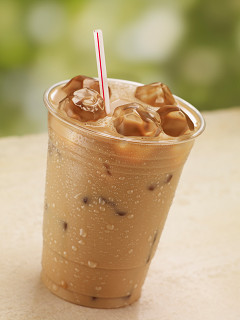 Craving a Chocolate Toffee Cold Coffee drink from Vintage Coffee. How about you? What’s your current coffee status? Thanks everyone for making my party-game-post-camp-laundry-washing so much fun. I love that so many of you chimed in with your guess as to how many loads of laundry it would take for me to get all of this clean. Let’s see that before picture again, shall we? I’m happy to say that I have now completed the task, and swept the camp dirt off the bathroom floor. Phew! Could have been worse. The whole family pitched in, especially to fold and put away all of the clean laundry. Katie, email me and I’ll create a gift certificate code for you for $25 worth of downloads from our shop! How Many Loads of Laundry? Oh look, it’s a spur of the moment birthday party game! Who says laundry can’t be fun? 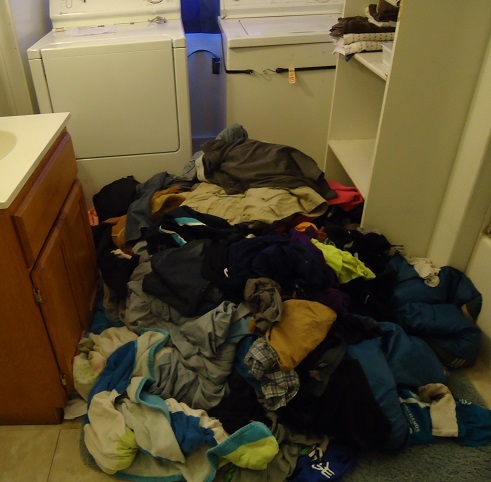 When we got home from camp on Saturday, I instructed everyone to dump all of their laundry – including sleeping bags, sheets, pillow cases, clothes, and towels – into the upstairs bathroom so that we could get started on the huge job of getting everything clean again. 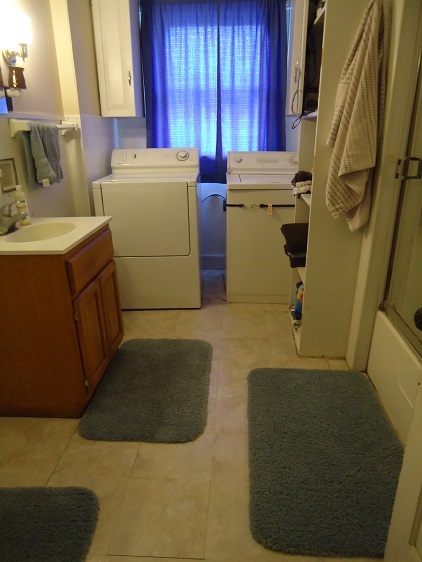 We have a fairly large bathroom, with washer and dryer included. The pile of dirty laundry took up almost our entire floor and was probably three feet tall. Not at all overwhelming. Let me share how thankful I am for the convenience of a washer and dryer. Even though my washing machine is old and has to be held together by a bungee cord so that it doesn’t shimmy, shake, and explode all over the bathroom, it works and is so much easier than me breaking my back over a wash board. Bless you, Ma Ingalls. And thank you, Maytag. I’ve been washing loads since Saturday at about 3:30 pm. I’m not even half-way done. So my question to you is this: How many loads of laundry do you think it will take to get through this pile? 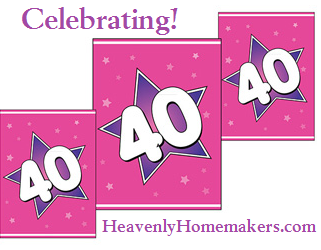 This being my birthday week, the correct answer better not be 40. But the tally marks are adding up, so we can’t be sure! Make a guess, and leave a comment on this post sharing how many loads you think it will take for us to get through our laundry pile. As soon as I can see my bathroom floor again, I’ll be back to reveal the final answer. The person who guesses correctly will win a $25 gift certificate to be used on anything downloadable in the Heavenly Homemakers Shop. If more than one person guesses the correct answer, I’ll throw each of their names into a (clean) hat and draw randomly. Every creature was stirring trying to get packed. That’s where the creativity ends on that catchy little Christmas in July song parody. I didn’t even bother to try and rhyme. Wait. Not true. I did give it half a second worth of thought. Mouse, louse, douse, packed. And that’s where the song ends. I don’t believe I mentioned that two days before camp, Justus, our 13 year old, had an out-of-town soccer tournament. Therefore, we had to be completely ready for a soccer tournament with all food and cold beverages and food (never enough food), plus five people worth of a clothing for a week, towels, hoodies just in case, sleeping bags, sheets, Bibles, shoes, flashlights, class teaching materials (for Matt and me), and twenty to ninety other random items – by the Friday before leaving for camp on Sunday. No biggie. The hoodies? They were argued over. “Mom, why did you put ‘hoodie and jeans’ on our packing list? We will totally not need them.” To which I answered that you never know when the temperature might dip down at the end of July at church camp and you’d sure hate to be stuck freezing in shorts and tanks so pack them because I am right. Oh, they will thank me once we’re there and they are chilly some evening. Which won’t ever happen because the lows are supposed to be hot. But still, just in case. While this picture surely throws us all into overstimulation because there is so much mess to look over at one time, your eyes undoubtedly landed directly on the bag of Bugles right there front and center. What can I say? Elias (11) dearly wanted to take a snack to camp that was all his own and not in the homemade granola or fresh fruit category, so I allowed him to spend $1 of his own money on whatever he picked out at the dollar store that wouldn’t give him an automatic cavity. He decided on a bag of Bugles. As you can see, after taking this picture I promptly walked back out of the kitchen and began writing a blog post about my mess instead of taking the time to clean it. Hey, I’d been working hard and needed to sit for a while, plus writing sounded like more fun than scraping smoothie gunk off the countertops. In hopes that we hadn’t forgotten anything. 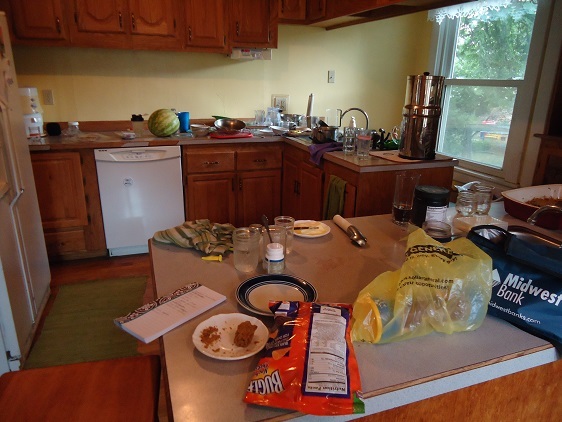 Seriously, I should just get back in there and clean the kitchen. And also, I should never, ever compose Christmas songs. Update: I wrote this last Friday afternoon while avoiding my kitchen. You’ll be happy to know that the kitchen was sparkling when we left for camp. Or at least it was a level better than disaster. And those hoodies? I’ve already worn mine twice. So there. We were blessed several weeks ago to spend a few days with some of our good friends that we hadn’t seen for two years. They are a family with two sons (ages 7 and 11) and a daughter (age 5). As the time for our visit approached, their little girl kept asking her mom questions about our family – specifically about our boys. Thankfully, she welcomed us in anyway, playing “little hostess” to our overwhelmingly male family. By the time we loaded up and headed back to Nebraska, we had made plans for their family to come visit us this summer. Holding onto the hope that she would see The Boy With the Glasses in a few short months, the little girl waved cheerfully as we pulled away. As our family sat at a basketball game recently, I pointed out a banner on a far away wall. My boys all looked over, read it, and chuckled. That is, all except for Elias. His reply was, “Hmm, are there words on it? I can’t read it.” Many questions followed, and it was determined that we needed to make an eye doctor appointment for him. 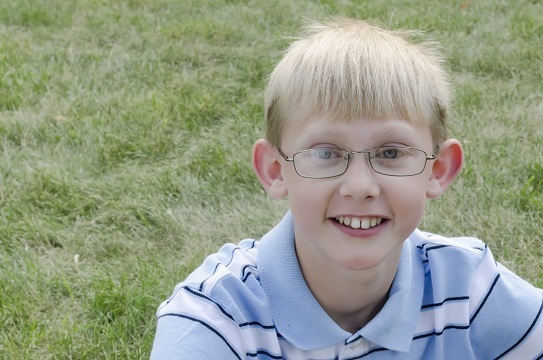 It was after this appointment that I called my friend to let her know (or rather to warn her) that when they came for a visit this summer, there would be not one, but two Boys with Glasses. Look out Coppinger household (and five year old girls). There’s a new kid in town. 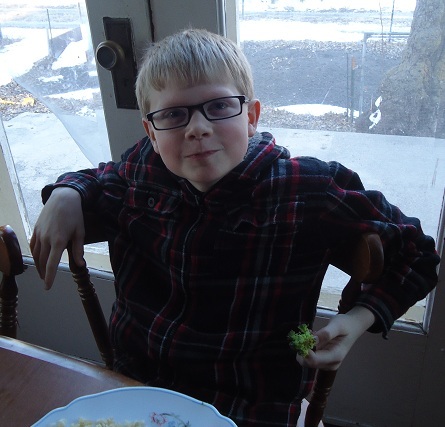 We’ve been having fun this week talking about when I got my first pair of glasses (I was right around Elias’ age!). Do you have glasses/contacts? How old were you when you realized you needed them? What is up with me encountering critters in my house? First the snake and now this. I will say, right from the start, that having a snake in my house was a MUCH worse experience than this one. This one was mostly just funny and made my children laugh at me. Early last week the boys and I took down our Christmas tree and decorations and boxed them up to store until next year. We keep all of our Christmas decor up in our attic, along with a various assortment of dust and dirt. The boys hauled all of the boxes upstairs and put them at the base of the attic stairs. I was then planning to take the boxes up the steep steps into the attic. So picture this: Four boys (fairly bored, disinterested, and relieved to be finished with packing up decorations) gathered around 6-8 boxes all of various sizes and shapes at the base of a set of stairs leading up to an attic. One mom (also very relieved to be finished with packing up decorations and ready to move on with life) picking up one of the boxes to begin the trek up the stairs to deposit the goods. Sounds innocent enough wouldn’t you think? Kinda makes you want to yawn, doesn’t it? I opened the attic door and carried Box Number 1 up exactly five steps before abruptly being greeted by loud flapping wings and a beak flying toward my face. I yelled something intelligent like, “Aaauughhh!”, and simultaneously jumped down all five steps in one leap, landing smack in the middle of my four boys and all of the remaining boxes. 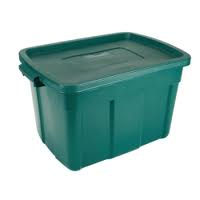 I also slammed the door to the attic while I was leaping…all while still holding Box Number 1. I have to say, the whole act was quite impressive and heroic. The boys looked quite stunned at first, because well…this was not part of our yearly Christmas storage tradition. It was then quite obvious that while they really wanted to make sure I was unharmed…they also really wanted to laugh. I’m also pretty sure they wanted to take a turn at the “go up five steps then leap back down while slamming a door” trick. Both of those activities are against the rules of the house…and to do them both at once? Cool. 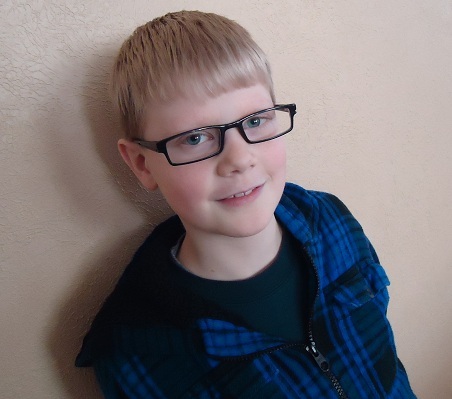 I believe my oldest was the first to find his voice, “What was THAT about?” he tried to ask without smirking. We had a nice laugh together, then left the boxes at the foot of the stairs for my husband to deal with later. My father-in-law just looked at me, quite interested and impressed with the situation. Geography. It’s probably my weakest subject. Next to Spelling. And Foreign Languages. But hey, at least I can make homemade cheese. We are in a group of people who are talking about subjects that go way over my head – like baseball statistics, politics, auto parts, building structures, capital gains, and the like. I try to smile and nod occasionally to at least look as though I am following along in the conversation. All the while, I am thinking in my head, “wow I feel like a complete dodo brain”. But I tell myself (while continuing to nod and smile politely) that it’s okay that I don’t know any of this stuff because God, in His great wisdom, made us all different to fulfill His purposes. And then I remind myself that while I have no idea what an acid dissociation constant is, at least I do know how to make cheese. And I bet that those who are talking about the above subjects probably don’t know how to make cheese, so there. And then I feel better about myself. I feel as though I should quickly let you know that while I do know how to make cheese, I haven’t actually taken the time to make it in over three years. But if I needed to I could, especially if someone were to ask me about quadratic equations and I needed to make myself feel smarter. So what was the point of this post? Oh yes. I was telling you that I’m not good at Geography. Now, the irony is that I actually got A’s in Geography in high school and college. As a matter of fact, in my college World Geography class, for our final exam, we had to (brace yourself) label every single country in every single continent on the planet earth and name each country’s capital. It was the Geography test of all tests. We were handed a big, blank world map and a pencil and away we went. I had studied my tail off for that test and ended up getting 100%, thank you very much. 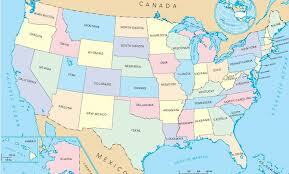 You would think that after taking that class I would be good at Geography. But no. I’m just good at studying for tests…and forgetting information promptly after taking a test. It’s rather pitiful. So to prove my complete Geographical cluelessness, you may find it funny to know that when I was talking to my friend Jodi about how we should get together some day – I almost suggested that on our upcoming trip to California, perhaps we could take a route that would lead us through to her place…in Ohio. Thankfully, before I threw out the idea, I decided that I had better look at a map. Sure enough, Ohio is exactly four states to the east of Nebraska. Which – in case you’re as bad at Geography as I am – is not the direction you take when you go from Nebraska to California. Okeedokee then. Once upon a time (otherwise known as last Saturday), I headed to the store to get some khaki pants for our son Justus. 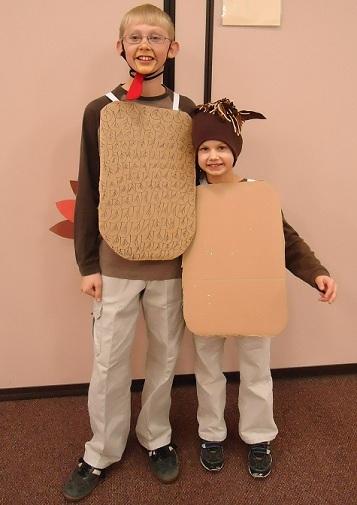 He was to be Terry the Turkey in our homeschool play that evening, and as we all know, turkeys wear khaki pants (as well as a red felt waddle hooked around a headband). Like a good mom, I had forgotten all about his need for khaki pants until the last minute. So off I went to the store at 4:00 in the afternoon – just two and a half hours before the kids needed to be in costume. I decided to make the most of my shopping trip and purchased a cart full of items: food to feed the youth group on Sunday; food to feed the YC basketball team on Tuesday; fruit for my family to eat; and of course, khaki pants. 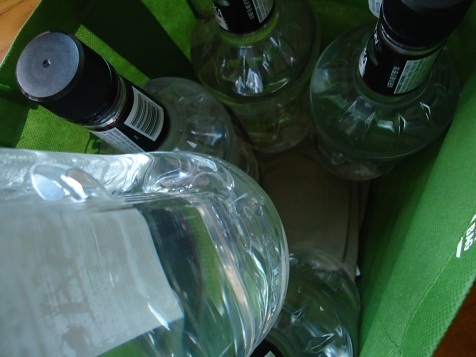 Oh, and did I mention that I also picked up three gallons of Vodka? Is it party time at the Coppinger’s house? Ummm…no. Vanilla beans are on sale, and it’s time to start another big batch of Homemade Vanilla Extract. 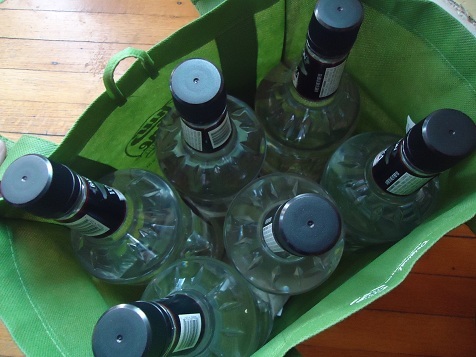 I’m never a fan of buying the vodka – especially three gallons at one time. I know I shouldn’t worry about what people think, but I do always wonder what goes through a person’s head when they see that amount of liquor in my cart. “Focus on the bananas and clementines in my cart, People!” I shout in my head. Yes, I’m pretty sure that’s an effective diversion. Anyway, I went through check-out with my very full cart full of fruit, youth group food, khaki pants, and vodka. Once I got home, all the boys came out to help bring in the loot. We put away all the groceries, slid the bag of vodka to the side of the kitchen for another time, and hustled to get ready to leave for the play. But where were Justus’ new pants?? We retraced our steps. We looked through the van. We ransacked the house. There were no khaki pants to be found anywhere. Aaaahhhh!!! I called the store. Had I left the pants there somehow? Had anyone found them? They looked. No luck. The khaki pants had vanished. Flustered, I gave the boys instructions to find some food, get their showers, and get ready (as much as possible) for the play. I hopped back into the van and headed back to the store. Aarrrgg! I did not have time for this!!! Back at the store, they were gracious when I showed them my receipt, assuming that the mistake was theirs, and told me to go get another pair of pants. I searched until I found another pair, showed them to the nice lady, and then flew out of the store. Back at home, I threw the pants at Justus, praying that they would fit. They did. Off we went to the play, where everything went off without a hitch. Allow me to introduce Terry the Turkey and Horace the Horse. The following day, as I was finally taking the vodka out of the bag to get ready to make vanilla extract, you will never believe what I found. There, under all those bottles…was a pair of khaki pants. You have got to be kidding me. I sure never thought to look UNDER the vodka. But indeed, there they were. I headed off to the store again, glad to have the mystery solved, and glad to return the pants so that the store didn’t have to “eat” the cost. The moral of the story is: If you ever lose your khaki pants, don’t forget to look under the vodka. 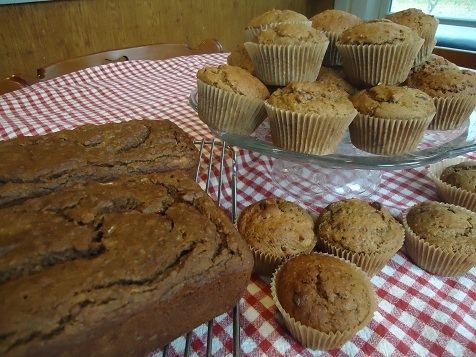 We Welcomed Fall With Pumpkin Muffins and Apple Bread. Oh…and Hot Cocoa. Yesterday, with the weather finally cooling off and the leaves falling all over the yard, I could do only one thing: Bake. Well, actually, I did more than one thing because we’re also switching out our summer clothes with winter clothes. Do you know how many loads of laundry that amounts to? Me neither, because I didn’t keep track. And I’m still not done. But hey, I sure am thankful God has provided so many hoodies for my boys. Seriously. Also, before I could bake, we needed to finish our school work. And lunch had to be made. Right after lunch, Matt and I had a meeting. Then I had a workout with Jen. Then Malachi had a soccer game, and Justus had two games to referee. And by the time we got home from the games we were starving (and frozen) so I made a quick dinner. But not before I switched out the laundry and started yet another load. And then…I finally had my chance to bake. Ahhhhhhh. Seriously, baking is a great way for me to unwind at the end of the day. I know. I’m weird. But just try putting some Applesauce Bread into the oven in the evening and tell me that smell of apples and cinnamon won’t relax you. Uh-huh. 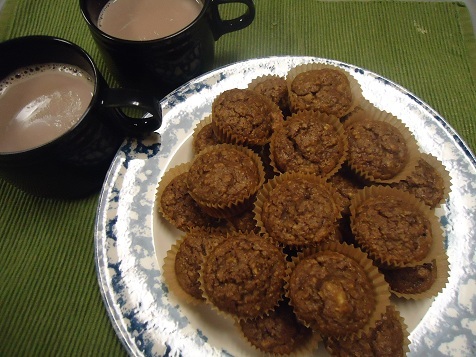 I made some of the Applesauce Bread into mini muffins, then made some Hot Cocoa (because after being home from Malachi’s soccer game for over an hour and a half, I still hadn’t thawed out). While the rest of the bread and some Pumpkin Chocolate Chip Muffins were baking, we all sat down in the living room with our mini muffins and hot cocoa while I started reading the latest book in the Ralph Moody series we’re reading. We’d planned to stop at one chapter, but who can stop with one chapter? So we continued to read, deciding to stop at two chapters. But at that point Ralph was lost in the mountains, and even though we all knew good and well that he would make it out alive because he had lived to tell about it many years later when he wrote his books, we still couldn’t rest until we had read a third chapter and knew that he was home safe and sound. This morning, Matt built a fire and we had Pumpkin Chocolate Chip Muffins with milk and sliced pears. I love fall. If you didn’t get them already, be sure to download your free fall recipe cards here, which include both of these recipes. Of course, you can simply click on the above links for the recipes too. Did I mention that I thought I was completely out of cinnamon at one point in the midst of my baking? Yes, there I was with apples and pumpkin – and an empty cinnamon jar. Tragic! Not to worry, I found a hidden jar of cinnamon up on a different shelf. Sheesh. The clock had just struck midnight. Why were Matt and I still awake? I’m not sure, but we were not to be awake for long. We were both right at that blissful point of drifting off to a peaceful sleep. For real? Right now? We were both so tired. But what were we to do when indeed, there was a bat in our living room? Matt got up. Team player that I am, I stayed under the covers. We discussed a strategy for getting the bat to go outside, none of which really sounded effective, but all of which involved a box, a broom, and a bath towel. What? You think you could have come up with a better idea? By the time Matt got to the living room, the bat was nowhere to be found. He decided to go upstairs and close all the doors so as to contain it, and more importantly, keep it from going into the room where the boys slept. Ahhh – there it was! In the upstairs hallway! He slammed all the doors closed quickly, then attempted to watch the pattern of the bat flying back and forth between the hallways walls – you know – like a video game – so he’d know just when to swoop in with the broom. Or the dust pan. 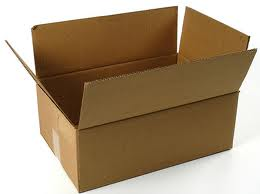 Or the box. Or whatever in the world might be the most effective way to get the bat outside. Back upstairs, Matt had the broom in readyness for swiping. His intent was to “stun” the bat, scoop it into the box, then take it outside. You’ve got to love a man with a plan. Ah, there it was – the opportunity! Swipe! Oh wow, and not only did it stun the bat, the bat actually fell directly into the box. How very convenient. Matt breathed a sigh of relief, then bent over to close the box. Oh but wait! The bat had a better idea. Up he flew, right toward Matt’s face! Whap! 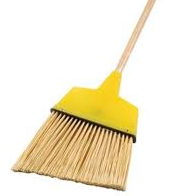 Instinctively, Matt swung the broom again. Success! And the bat was put into the box and taken outside. Ending score: Bat 0—My Hero 1. Matt was more than a little bit pumped up with adrenaline at that point, and as you can imagine, had a difficult time going to sleep, even if it was almost one in the morning by then. Me? Once I knew he had the bat outside, I gave my courageous husband a groggy “Great job, Babe”, then promptly rolled over and conked out. I figured that at least one of us needed a decent night’s rest in order to take care of the kids in the morning.